Hello one and all, firstly I have to apologise as I recently I have been a bit MIA. This is due to starting university again, for any that go to uni or have started you will know how busy the first few weeks are just until things start to settle down again! I have just started my second year and have been bogged down already with work, applying for placements which I will hopefully be doing next year and seeing all of my friends again who I have not seen since summer started. Now one thing that I think is very important to join while at uni are Societies. Unfortunately due to various circumstances last year I did not join any. This set the tone for what became a very lonely year for me, so one thing you must do is JOIN, JOIN, JOIN anything you can. One society I have joined is the dance society, with this I have been talking a number of dance classes which are beginner ballet, modern, theatre and street dance. Another aspect of a society is that we have weekly socials the first week we were animals and this week we dressed up to the theme of 80's fashion. So this is what I want to share with you this week the outfit I came up with when faced with the challenge of 80's fashion. For my look I took quite a bit of inspiration from early Madonna and fame (as I just love that movie). During the 80s they were really into patterns, bright colours and big hair which were all areas I focused on. - Top – Primark (£5.00) while I bought it for the outfit, it is really comfy so I have been wearing it a lot. They also had it in a burgundy colour which I wish that I had bought! - Skirt – yumi, I do not know the price of this as I bought it years and years ago. While I used to wear it a lot, it was something that I had half forgotten about so I am glad that it has gotten another outing. They belt is also attached to the skirt. - Leggings – Primark, These are the only leggings that I buy. While they can be a bit see through I find that if you decide to wear them with just a top (something I do rarely) you can just double them up. - Shoes – Dorothy Perkins, (£10.00) I got these in the sale as I have never really been into the plimsolls craze and thought that I would go cheap and if I like them I would buy a more expensive pair. I have to say though I am completely a convert, these are so, so, so comfy although white may not have been the best colour when it comes to dirt. 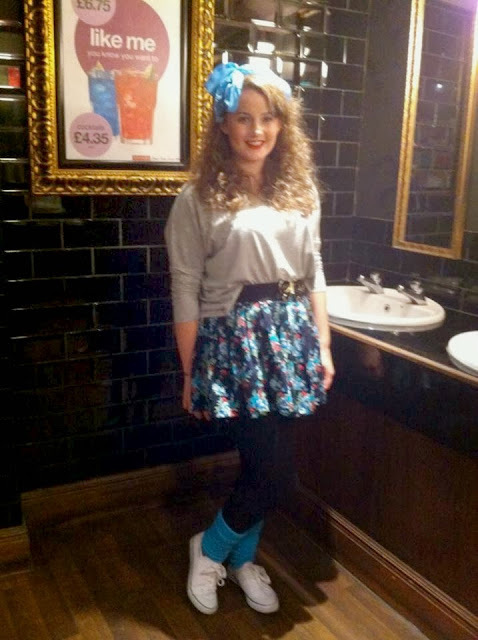 - Leg Warmers & Bow – TopGirl (Both £2.99) I got both of these from a local dressing up shop. I decided on the colour blue before I knew that I was going to be wearing my blue pattern skirt so it all worked out well. I think these were two big aspects of 80's fashion it was all about the dancing crazy which is where the legging came in. Similarly their hair accessories had to be big like the hair. For my hair I tried to stay true to the big hair of the time. To create this look I applied L’OREAL Elvive Styliste curl control defining mousse to my hair, everyone needs different amounts of this but I used just slightly less than a palms worth, then scrunched it into my hair. Next I flipped my hair upside down and used a diffuser on the cool setting, as if I apply heat to my hair it tends to go very frizzy which was not the look I was going for. When it was halfway dry I applied a little bit more mousse scrunching it in again, and then I continued to dry my hair upside down with a diffuser. My makeup look was quite simple as I was going for a neutral eye look. From Urban Decays Naked pallet, for the inner corner I used sin mixed with a tiny but of sidecar, for the lid I used toasted and for the crease I used Hustle. I went on to use Maybelline’s Gel Eyeliner in the colour Black/Gold on the top on my eyelids to define my eye. I applied this using a real techniques brow brush as I find it gives you lots of control, I also applied a little bit of Rimmels soft kohl in jet black to my water line before I applied my Maybelline Falsies mascara. Two areas which were important when It comes to 80's makeup were bright lips and bright cheeks. So I applied Kate Moss by Rimmel In shade 01 to my lips to give a red lip effect and Max Factor Flawless perfection Blush is shade 221 classic pink. What you have to remember with the blush is to apply it heavily taking it up to the temple as well as applying to your cheek bones. I hope this helps you to create a 80's style look have you dressed up in this style before if so how did you achieve the look ? I love this, you look so cool! Dressing up is fun, and you look great! Your hair is amazing, super jealous!